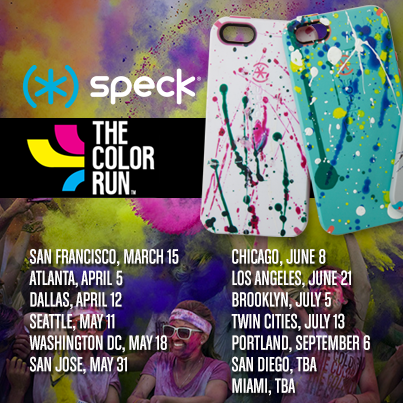 Speck is excited to announce that we’ll be following The Color Run to 13 cities across America in 2014! We’re pumped to partner with “the happiest 5k on the planet” by sending contestants home with one-of-a-kind CandyShell cases so they can keep living out The Color Run in Speck style. First stop’s right in our own backyard, back-to-back races this Saturday March 15 in San Francisco. Join us at our colorful, decked-out booth where we’ll be helping YOU splatter paint our award-winning, military-grade protective CandyShell cases. Get creative, and take home any of your customized designs so you can go boldly, never bulky, wherever your next run may take you. Follow Speck at The Color Run on your favorite social media site using #longlivecolorful.